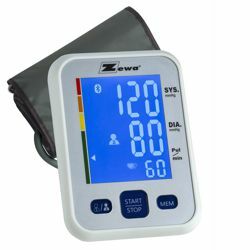 The UAM-880 Ver 2 is our next generation wireless blood pressure monitor. It measures on inflation resulting in a faster more comfortable measurement. While it stores readings for 2 users (2 x 60) it can also connect to an Android or iOS Mobile device using our MyHealthConnected App. Allows 2 different users to monitor and track their own readings. 60 Memory storage for each user with date and time. Automatically calculates the average of last 3 readings. Automatically stores the date and time when a blood pressure reading is taken. Easy to read color scale (green, yellow, orange, red) indicates if blood pressure is normal, pre-hypertensive or hypertensive. If irregular heartbeat is detected, an indicator icon will appear alerting you so you can consult your medical professional. Use the device with an AC adaptor instead of batteries (AC Adaptor not included in all models). Connects to Android and iOS mobile devices.